The Audi Q7 SUV is a top of the line vehicle unveiled first in September 2005 at the Frankfurt Motor Show. 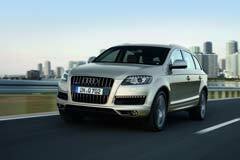 The Q7 definitely has presence and one that speaks with masculinity and deftness. This design gives off a sense of solidity and sturdiness. The Xenon headlamps are curved and are equipped with daytime running lights. The accentuated bumpers and the optional panoramic glass roof provide the car with a sporty look. The Audi Q7 is available with a choice of powerful engines, including a V6 diesel engine and a V8 diesel engine. Another model variant, Q7 3.0 TFSI consists of V6 gas engine that has a top speed of 150 mph. The Audi Q7 incorporates stunning interiors, including a steering wheel covered in premium leather fabric, plush seats, a Bang and Olufsen Advanced Sound system and 6.5-inch MMI color display. The car seats seven and thus has three rows of passenger seats. 2012 Q7 3.0 TDI Premium Audi Q7 Orca Black Metallic with 87663 Miles, for sale!